A war fueled by the dark powers of sorcery is about to engulf the peaceful land of Osten Ard – for Prester John, the High King, slayer of the dread dragon Shurakai, lies dying. And with his death, an ancient evil will at last be unleashed, as the Storm King, undead ruler of the elvishlike Siti, seeks to regain his lost realm through a pact with one of human royal blood. Then, driven by spell-inspired jealousy and hate, prince will fight prince, while around them the very land begins to die. Only a small scattered group, the League of the Scroll, recognizes the true danger awaiting Osten Ard. And to Simon – a castle scullion unknowingly apprenticed to a member of this League – will go the task of spearheading the quest for the solution to a riddle of long-lost swords of power…and a quest that will see him fleeing and facing enemies straight out of a legend maker’s worst nightmares! 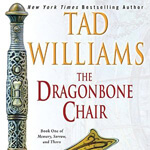 This is the first book in a trilogy from Tad Williams. The story was originally published in the late 1980’s, and it’s good to finally have it available in audio. The audio is likely coming in advance of a new trilogy from Williams, a sequel to the Memory, Sorrow, and Thorn trilogy that this book is the first in. The book is set in Williams’ world of Osten Ard, and from what I can tell (based on the names and words used in the book), Osten Ard is a Nordic country/world. This first book, The Dragonbone Chair, is a sort of coming of age tale for main character Simon, as he struggles to survive in a world that’s rapidly changing. The main story arc is familiar to those who read a lot of fantasy, or those familiar with Joseph Campbell’s writings on mythology. In the first part of the book, the reader (listener, in my case) is introduced to the world of Osten Ard, specifically Hayholt Castle, where Simon is born and raised. His father is mysterious and his mother died in childbirth, Simon works as part of the serving staff in the castle under King John Presbyter. As a teenager, Simon begins to take instruction from the wizard Morganes, and through this lens the reader learns a lot of the history of the world. When the king dies, though, and his eldest son Elias takes over ruling the land, the world seems to turn. There is a drought and plague, and the roads no longer seem safe. Some blame this on Elias’ advisor, the red priest Pyrates. Elias’ brother, Josua, is one of those, and escapes the Hayholt to head north to gather troops to take on Josua. Morganes and Simon help Josua escape, and Morganes dies in punishment from Elias, allowing Simon to escape into the world to try to join Josua. Thus begins Simon’s adventure and growth into a man as he struggles to survive in a very difficult time in the world of Osten Ard. On his travels, he meets a troll, Binabik, and accidentally saves a “Sithi,” one of the old race from the north of Osten Ard. Binabik becomes his traveling companion and they make their way to Josua. When they arrive, an old priest reveals that the terrors being wrought upon the world are the work of the spirt of Ineleuki, a terrible magician from 500 years prior. The northerners fear that the end of the world is near if they cannot stop this black magic. Here, the reader learns about three swords that, united, may be able to turn the tide. One sword, Sorrow, is in Elias’ posession. Another, Minneyar (Memory? ), is lost, and the third, Thorn, is believed to be even farther north in the land of what remains of the Sithi and the trolls (two different races). Simon begins a second quest, along with Binabik and some men from Josua’s court, to find this third sword, while evil remains in the world and Elias mounts an attack on Josua. The story, while familiar, is engrossing. Having read some of Williams’ other works, I’ve found that there are times that they can feel a little plodding, a little drawn out. The Dragonbone Chair never felt this way. Scenes move swiftly and there is always action. Fighting scenes kept me on the edge of my seat and nervous for what would happen next. I also enjoyed looking for parallels in this work to others, such as the tales of King Arthur, as well as trying to piece together what would be next in store for the heroes, just as they were piecing it together. Unfortunately, the combination of the narrator’s accent and the “odd” names/places in the book made it difficult to understand at times, while listening. Sometimes, too, the narrator at times overdid the accent and/or spoke quietly (because the character was speaking quietly). I was glad that I had the physical book (a copy I’d picked up a few years ago in a book exchange) to refer to and keep track of what was being said. I think that when I listen to the next book in the series, I’ll purchase the ebook to follow along, as needed. I think Wincott did a great job with the narration, even if it was difficult to understand at times. His voice reminds me of some of the British narrators who sound a little bit like someone’s grandfather, reading a story aloud. Despite the difficult place and character names, and even if some of the fantasy arc was “typical,” I really enjoyed this story, this introduction to the weird world of Osten Ard. I can’t wait for the next book to be released in audio. The master at his scarifying best! From heart-pounding terror to the eeriest of whimsy – tales from the outer limits of one of the greatest imaginations of our time! In “The Mist”, a supermarket becomes the last bastion of humanity as a peril beyond dimension invades the earth. Touch “The Man Who Would Not Shake Hands”, and say your prayers. There are some things in attics that are better left alone – things like “The Monkey”. The most sublime woman driver on earth offers a man “Mrs. Todd’s Shortcut” to paradise. A boy’s sanity is pushed to the edge when he’s left alone with the odious corpse of “Gramma”. If you were stunned by Gremlins, the Fornits of “The Ballad of the Flexible Bullet” will knock your socks off. Trucks that punish and beautiful teen demons who seduce a young man to massacre; curses whose malevolence grows through the years; obscene presences and angels of grace – here, indeed, is a night-blooming bouquet of chills and thrills. I’m not generally a fan of short stories, but I am a big fan of Stephen King. I’ve read two collections by him prior to this one: Hearts in Atlantis and Different Seasons. I thought both of them were stronger collections. The main difference is those contain fewer, but longer stories I think. This one has been on my radar for a long time, in particular because of The Mist, which is the first (and longest) story. It’s actually a Novella, where the rest are short stories. It’s supposed to have “major” ties to his Dark Tower series, and one of the few in that category I haven’t read already. Personally I found it being a “major” connection to be a stretch, especially compared with most of the others. So if like me, you’re wanting to read all the associated works, I personally think you can skip this one without much issue. There are 3 stories worth calling out for this collection of 22 (although calling 2 of them stories is overly generous). The best story was probably Mrs. Todd’s Shortcut. I thought it was fantastic. I also really enjoyed The Monkey and Gramma. Paranoid: A Chant and For Owen round out the bottom. I guess if you have little fragments of writing you think are interesting, sticking them in such a large collection is the best way to publish them, but I think the collection would have been stronger without them personally. As to the rest you can consult my list of ratings below. This book has 13 unique narrators, some of them reading several stories. Will Patton, Frances Sternhagen, Paul Giamatti, and Norbert Leo Butz were the best narrators of the group. None of the narrators were bad, but most of them were unmemorable. You can see my full ratings below for each performance. Throughout the vast lands controlled by the Ironship Trading Syndicate, nothing is more prized than the blood of drakes. Harvested from captive or hunted Reds, Greens, Blues, and Blacks, it can be distilled into elixirs that bestow fearsome powers on the rare men and women known as the Blood-blessed. As lives and empires clash and intertwine, as the unknown and the known collide, all three must fight to turn the tide of a coming war – or drown in its wake. Executive Summary: A great start to a new series. It blends a lot of different things together in an interesting way to feel original. I’m really looking forward to see where he takes things from here. 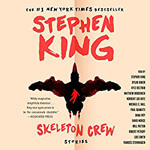 Audiobook: Steven Brand is a great narrator. He reads with good inflection, and does a few voices. In the past my main complaint about him has been he speaks too quietly. He’s either fixed that, or the people making the books are adjusting his volume up to make him a lot easier to hear than past books I’ve listened to. I absolutely loved both Blood Song and Tower Lord. It’s possible that it made it impossible for me to love Queen of Fire. Either way, I was disappointed enough in that book, that I was reluctant to pick this one up. I had planned to wait on reviews from people I trusted to come out before getting it. Then a review copy fell into my lap. This book is kind of a hodge podge of several things I love: Mistborn, Indiana Jones, James Bond, and Dragons. And if that’s not enough there is also high sea adventure, and pirates! That may sound like a mess, but Mr. Ryan does a great job in blending those elements together. I also can’t guarantee all of those things were influences on this book, but they are things I thought about as I was reading. Mistborn has one of my all time favorite magic systems. This one feels similar, only a little less structured, and with only 4 known types of abilities. The main similarity is the idea of imbibing something in order to do magic, and that only a small number of people are born with the ability. Beyond that they are quite different. My favorite character is Lizanne, who is basically Jane Bond. Her story line was always my favorite, and I really want to know more about the training she went through. I hope we get some flashbacks or possibly her training new recruits in future books, but then I’m a sucker for the magic school trope. Clay was also a great character, and a more reluctant protagonist then Lizanne. His story was reminiscent of an Indiana Jones story, with him being basically nothing like him. If anyone is Jones it’s maybe his uncle. The final protagonist, Lt. Hilemore was enjoyable enough, but I spent much of the book wondering how his story fit in with the other two. Rest assured it’s made clear by the end of the story, but it takes awhile. That doesn’t mean his story wasn’t interesting, it just felt disconnected from the rest of the book for me. With him you get high seas battles and pirates! None of that even scratches the surface of the great supporting cast. Each subplot has it’s own supply of interesting characters. And if 3 interesting protagonists influenced by different elements, and a great supporting cast isn’t enough. There are Dragons. And really, isn’t that enough? Overall, I’m glad I got this is a review copy because I really enjoyed this book. I just hope he can take his time on the sequels because I felt like his last book suffered from rushing to completion to meet a deadline. I love getting new books in a series once a year, but I’m willing to wait longer if the author needs more time. I’m hoping he’ll be able to bring this to a more satisfying conclusion than his previous series. To start I will say that I was about to give up on Star Wars books because I haven’t been enjoying them lately, but now I’m telling my friends that do like Star Wars book to go read this one because we might be turning a corner here. What starts out as a slow, politics-laden story became a fun Star Wars book that actually had meaningful events. The recent flow of Star Wars novels have felt like filler more than content so it’s about time a story actually starting to really fill in some of the events between Episodes 6 and 7. The book isn’t perfect by any means but I enjoyed it well enough and it gives me hope that more good novels could still happen. Did you miss all the politics that didn’t happen in Episode 7? Well you are going to love the beginning of this book. Glad there weren’t politics in Episode 7? Be patient with the beginning of the book and you’ll be rewarded with some redeeming adventure afterwards! The story begins with tension in the senate between Democrats and Republicans in the senate….err I mean Centrists and Populists. Really the whole two party system felt like an allegory for the current political climate in many ways. If you’re sick of all the primaries and partisan stuff going on, you’ll be able to relate to the nonsense going on here. Both sides of the New Republic government see each other a villains or weak and their bickering means nothing gets accomplished (see what I mean about it being just like our government???). Enter a real threat and everyone is too busy arguing to pay any head so lets send a bipartisan contingent to investigate! Leia (populist) volunteers to go on a mission to investigate this criminal organization and an annoying, pompous centrist volunteers to go with her. Enter Ransolm Casterfo. This guy starts out pretty annoying but I actually came to really like him after the first little foray of adventure. He has more depth to him than many other Star Wars characters and is given many nuanced decisions to make throughout the book while dealing with the fact that he becomes friends with his political enemy. He has a big role to play in this story and does not disappoint. There are a couple of other interesting characters that are introduced in this novel and they are also often more than they seem…but Ransolm Casterfo is the best of them. Speaking of adventure, the action has a bit of a rocky start but gets to be more interesting as the story progresses. There were some moments early on when I got pretty tired of Leia being some kind of expert of the criminal world and acting pretty reckless, but a lot of that pulpy behavior faded out as the story continued. Star Wars is still the kind of world where you don’t send special forces or spies to investigate criminal organizations, you send some of your most important leaders (Like how Star Trek always seems to have the top ranking officers of the ship on dangerous away missions). 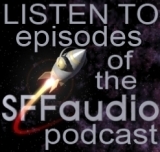 As for the audio side of things Star Wars continues with its great formula of great narration, music, sound effects, and atmospheric sounds. January LaVoy does a great job with the narration even though her range of distinct voices isn’t as varied as some. The music and special effects were great as usual with some odd music choices for some scenes but some very poignant choices for others. 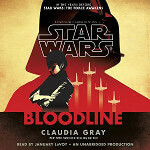 Most of the atmospheric sounds were good but some scenes go on a while and I felt like the background noise was on a bit of a loop – a problem I haven’t heard from a Star Wars audiobook since Star Wars: Kenobi (thank goodness it wasn’t very distracting). Augustine, a brilliant, aging astronomer, is consumed by the stars. For years he has lived in remote outposts, studying the sky for evidence of how the universe began. At his latest posting, in a research center in the Arctic, news of a catastrophic event arrives. The scientists are forced to evacuate, but Augustine stubbornly refuses to abandon his work. Shortly after the others have gone, Augustine discovers a mysterious child, Iris, and realizes that the airwaves have gone silent. They are alone. At the same time, Mission Specialist Sullivan is aboard the Aether on its return flight from Jupiter. The astronauts are the first human beings to delve this deep into space, and Sully has made peace with the sacrifices required of her: a daughter left behind, a marriage ended. So far the journey has been a success. But when Mission Control falls inexplicably silent, Sully and her crewmates are forced to wonder if they will ever get home. As Augustine and Sully each face an uncertain future against forbidding yet beautiful landscapes, their stories gradually intertwine in a profound and unexpected conclusion. 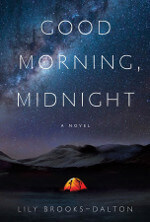 In crystalline prose, Good Morning, Midnight poses the most important questions: What endures at the end of the world? How do we make sense of our lives? Lily Brooks-Dalton’s captivating debut is a meditation on the power of love and the bravery of the human heart. Isolation, loneliness, facing down death. This book contains two interwoven narrative threads. One belongs to an aging astronomer named Augustine. The other thread belongs to an astronaut named Sullivan. Something bad appears to have happened, and Augustine chooses to remain at a remote Arctic base as everyone evacuates. Sullivan is on her way back to Earth from Jupiter when Mission Control goes dark. The premise is appealing. I have a fondness for cold and hard distant landscapes. The arctic and space is ripe and powerful for story. Lily Brooks-Dalton writes a strong opening and a heck of an ending. It is a successful ending as it turns me inward. I am still thinking about… well, no spoilers. I felt Sullivan’s narrative thread was stronger and better written. As character, she is more round and engaging than Augustine, at least for me. Most of my complaints are founded in my own study of writing and story, and may not be fair or interesting to the general reader. As characters go, Augustine was a disappointment, but Sullivan and her crewmates more than compensated. As noted, I felt the beginning and ending was especially well crafted, but the middle seemed to lag, and the writing here didn’t feel as refined. This leads me to my biggest bug, and this is pacing. I felt that too much of this story was back on its heels, and while this certainly can be metaphor to mirror an inward introspective sense of self and life and universe, at times this slowness pulled me from story. I also would have appreciated a deeper excavation of setting. This has two narrators, one for each story thread. John H. Mayer handles Augustine’s portion, and Hillary Huber takes care of Sullivan’s. I usually dislike more than one narrator, as I feel it runs the risk of getting in the way of what is being read, but this was handled quite nice, and I have no real complaints about the decision to use two readers. Both Mayer and Huber were pleasing and I found each voice suited the character. My only issue came with Huber’s accents. There is a South African, Russian, and an American Midwest accent that are rendered a tad dramatic. I think we can agree that this is a small thing, but it still kind of bugged me, and pulled me out of the moment. This is a solid 3.5 out of 5, and I think if I weren’t so hyperaware of craft and story as story for story’s sake, I’d probably nail a 4 out of 5 on this book. In short, this is a fine book, and if you are at all interested by what this seems to be about, I think you’ll genuinely like it, a lot. The gripping story of a group of American scientists sent to the ocean floor to investigate an alien ship, only to confront a terrifying discovery that defies imagination. Executive Summary: A strong start and a pretty strong finish, but I found a lot of the last quarter or so on the slow side. This is a pretty solid 3.5 stars that could be rounded up or down depending on my mood at the time. Audiobook: This book had been released in audio before, but for some reason Brilliance Audio seems to be (re)releasing a bunch of his books recently. Scott Brick does his usual quality job. Whenever you see Mr. Brick’s name on an audiobook, you know you’re going to get a good reading. I came into this book thinking it was a reread. I did a handful of books by Mr. Crichton when I was in high school, and I thought this was among them. As I got further into the book, I became convinced otherwise. I found the beginning very interesting. A psychologist is brought in to help with a crash that turns out to be a spaceship on the bottom of the ocean. I liked the mystery and investigation aspect of the story, more than the viewpoint of the main character itself though. As the plot develops and we learn more about not only the ship, but the sphere it contains, I found my mind starting to wander. I didn’t get attached to any of the characters. I found myself annoyed by most of the scientists. Several of them seemed to be more concerned about being published and/or their place in history than the actual investigation itself. I’ve always been more of an engineer than a scientist, but I don’t know why anyone would want to deal with that. As with the other Michael Crichton books I’ve read, this one takes science and posits some plausible seeming possibilities. He always seemed to have a knack for the techno-thriller in a way that doesn’t feel cheesy and over the top. 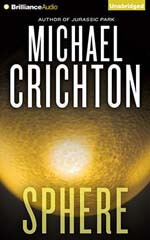 I’m not sure if I was disappointed with the truth of the Sphere, or if my detachment from the characters just got to me, but by about the 50% mark, I found my mind starting to wander a bit. The ending was pretty strong though, and probably saved it from me rounding down to a three. I’ve been wanting to take a break from SFF this year, and while this is definitely still in the Sci-Fi wheelhouse, it’s more of a thriller with a sci-fi premise than a pure science fiction book. I didn’t enjoy it nearly as much as Timeline or Jurassic Park, but I’m glad I finally read it.